Some time ago, I already introduced you to Norwegian Pop Princess Astrid S. Ever since releasing her latest EP “Party’s Over” things have only been going up for her. On September 12 she embarked on a world tour through the United States and Europe. After opening up for Troye Sivan in Antwerp last year, it was finally time for her to perform her first SOLD-OUT headlining show in Brussels. Of course, I was there! After selling out Club Witloof in Brussels after a few minutes, Astrid S’ concert was moved to De Rotonde which sold out again in minutes. Judging by the enthusiasm of her fans, she could’ve easily sold out a bigger venue. And that’s what probably took the Norwegian singer by surprise the most: with tears in her eyes she witnessed how strong her fanbase is in a tiny country like Belgium. And after putting on such a strong performance, it will only get stronger. Apart from her musical qualities, there’s one thing I absolutely love about this girl: she’s the most down-to-earth artist I have ever seen. Right before the doors to the venue are about to open, she just casually drops by the merch table and waiting line. She definitely doesn’t hide for her fans, that’s for sure. Just like how she just sits down in the venue’s restaurant to have a bite of food, waving friendly to fans who are passing by. And when she meets her fans, it’s like she’s just hanging out with friends. It’s genuine and something you can’t fake. To me, one of the most important things during a concert is what you feel when the lights go dark and the music starts. It’s a very special feeling and ambiance. Teasing the crowd with the tunes of ‘Sushi‘, to eventually appear on stage and start the night with ‘Bloodstream‘, Astrid S immediately set the mood. Everything just felt right, right from the beginning. 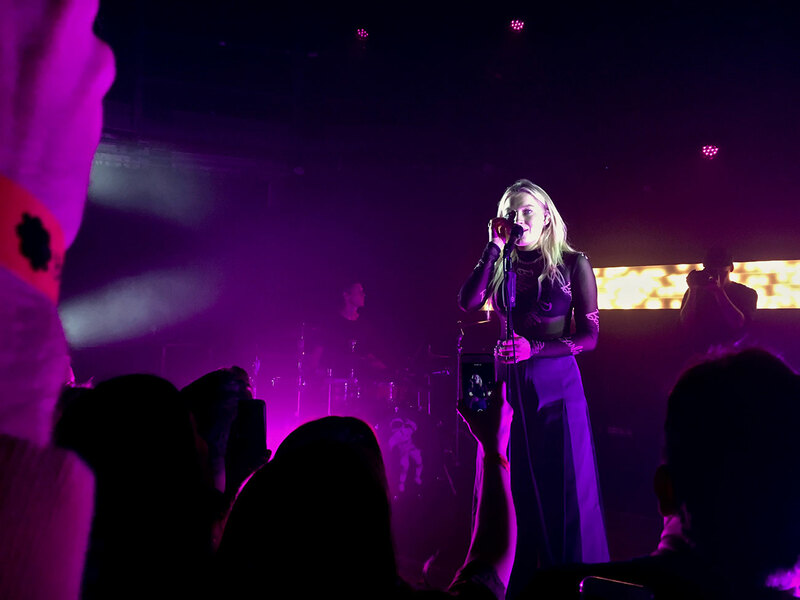 Although it feels like she isn’t yet 100% comfortable with being on stage, Astrid S was born to perform. In between the songs, while talking to the crowd, the somewhat shy girl starts showing. But as soon as the music starts, there’s nothing left of that shy girl. I witnessed countless headbangs, hairflips and jumps. Her energy is truly amazing and radiates to the crowd. The moment that stuck with me the most was when she talked about how difficult it was to move away from her parents, and how she wrote the song ‘Mexico‘ about it. After starting the acoustic performance, waving smartphone torches started filling the small and intimate venue. And with that, Astrid’s eyes also started filling… with tears. Clearly moved and emotional, she continued the song, absolutely NAILING it. I’m so excited to see what the future holds for Astrid S, and I will be definitely following career every step of the way. There’s no doubt that I will stand in line when she returns to Belgium.